They are already around ! Earth, take a good look. It might be your last ! 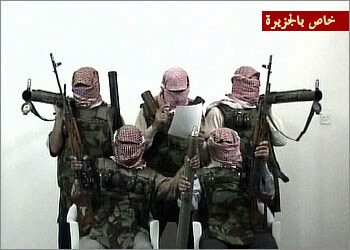 AL-JAZEERA (if not indicated otherwise). into a national uprise ("a matter of the people") ? north and west of Baghdad. the attackers have sharply increased U.S. casualties in Iraq. Missile attack on a central U.S. post in Ramadi. grief to the celebrations of U.S. 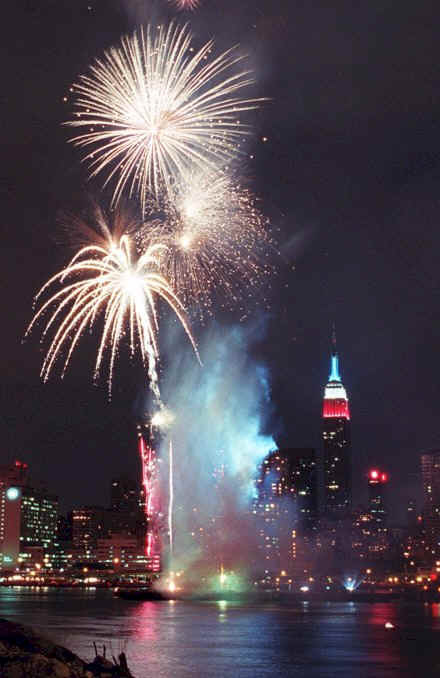 Independence." 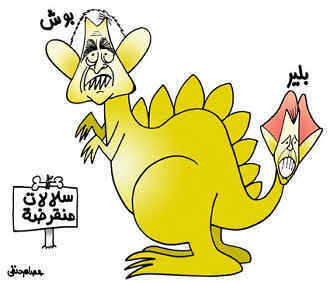 to Iraqi resistance on its way (against foreign ocupation) ? 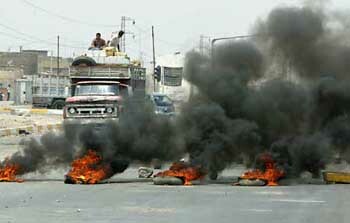 last Saturday for having ignored the curfew in Baghdad (AFP). "Blair is decided to continue the war in Iraq. as a means of resistance. And Bush criticizes those who step aside (from his policy)." "Missile attacks directed against occupation forces in Iraq." "by ranks" during continued attacks of (Iraqi) resistance. Ramadi after last night's fierce engagements. 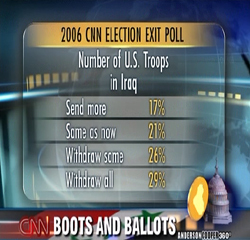 reports in the run-up to the war with Iraq. a dossier on Iraq had been "sexed up". before the U.S.-led invasion of Iraq. being attacked in Al-Fallujah and Diyala. Four aggressors could bee killed during the clashes. U.S. fighting in Mosul (Al-Mawsil in northern Iraq). Shiite leaders in the town of An-Najaf. 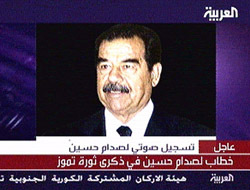 Saddam Hussein’s sons killed or arrested"
as well as one U.S. soldier and five Iraqis wounded." as well as two notables (sheiks) of the (Shamar) tribe. the troops are trying to prove. increased the chances of being found. the actual U.S. body count is 47 since the "official end of warfare" on May 1. 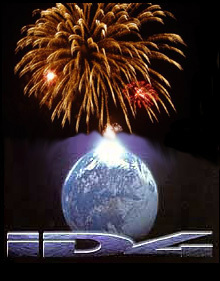 On 2/8/2003 this number has risen to 53 according to German National TV. It should include two U.S. soldiers who died in action on 31/7 (Al-Jazeera). "With the death yesterday of another U.S. soldier in Iraq, the number of U.S.
ties comprises all cases of accidental death registered by the U.S. military authorities. On 8/9/2003, German National TV reported an actual number of 149 U.S. casualties. WASHINGTON POST, offering you a closer look at those who lost their lives in the Iraqi hell. This service is updated weekly ! secretary of defence Paul Wolfowitz. Instead, both assure objectivity of information. inducing Iraqi resistance against occupation ? 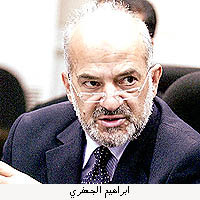 "Jordan is hosting the daughters of former Iraqi president"
under supervision of Jordanian authorities." xxxxxxxxxxxxxxxxxxxxxxxxx No to Unemployment ! He confirmed the hostilities which are challenging the U.S.
sites and are certainly not involved in uprise". that are losing their lives in succession. of monetary funds, are likely to exceed the original plannings. Such, the U.S. 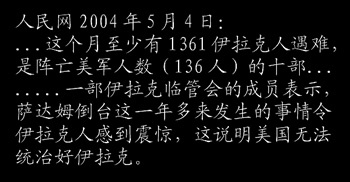 Translation of an excerpt from the Chinese text by Wolfgang Wiesner. Headline: "In Basra, Worst May Be Ahead"
prices that have accompanied them. of attacks directed against occupation troops. that ruined Iraqi economy during the past years. to death. (Revenge) will happen in many ways and will be of different character. neither where, when, and how we beat nor who of us will beat." Sun Bin: "The Art of War"
King Wei asked, "Is there a way to attack an enemy ten times our strength ?" not expecting you and when he is unprepared." Islamic clerics, Ayatollah al-Hakim, should be among the victims. 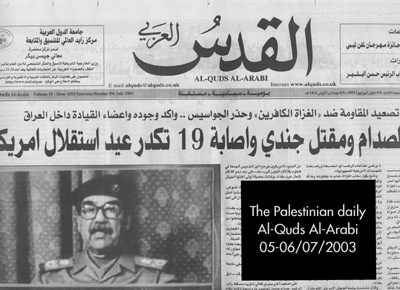 (look above for an article published by ASHARQ AL-AWSAT, 26/8/2003). 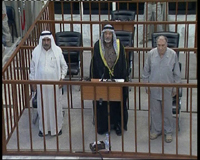 the number five on a U.S. list comprising the most wanted Iraqi leaders, has been arrested. intervening in the proceedings of its creation ? 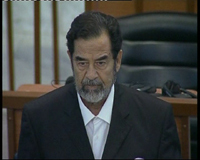 14/12/2003: Saddam finally caught - War will continue ! Exclusiva / Hablan los portavoces de Ansar al Sunna, uno de los principales grupos de la resistencia iraquí. An interview with spokesmen of Ansar al Sunna, one of the most important groups within Iraqi resistance. al que culpan de la ocupación estadounidense. whom they blame for the U.S. occupation. "No somos terroristas echaremos al invasor con la guerilla que es un invento español." which is a Spanish invention." "La 'yihad' es algo obgligatorio para los iraquíes." "The 'Holy War' is indispensable for the people of Iraq." de destrucción masiva ni con Al Qaeda." of mass destruction nor with Al Qaeda." nos alimenta la fe y a los americanos el dinero." the Americans are driven by money ." 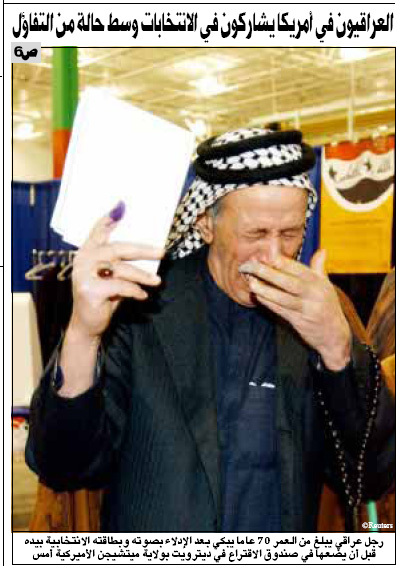 April 2004: Beginning of the "Holy War"
just cause of the Iraqi resistance movement. though it is a religion of tolerance and love. as well as Iraqi resistance against U.S.
Excerpts from an interview with Egyptian president Mubarak, published by the reputed French daily LE MONDE, Paris. assassination of two Hamas leaders, Egyptian President Hosni Mubarak said in comments published Tuesday. in a reference to the Middle East. Americans. After what happened in Iraq, there is an unprecedented hatred and the Americans know it,"
said Mubarak, regarded as one of the Middle Eastern leaders relatively sympathetic to the United States. He said the first cause of terrorism was injustice. "Look at what is happening in Palestine and in Iraq. Where there is pressure and injustice there are terrorism and attacks," he said. 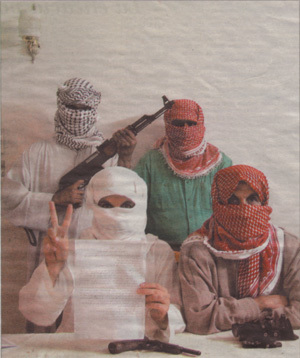 talist Islamist movements to fight the influence of the former Soviet Union. danger. You should not meddle with the faith and beliefs of people." U.S. soldiers killed in action (136 during the same time). Military encroachment and civilian unrest are ruining Iraq. 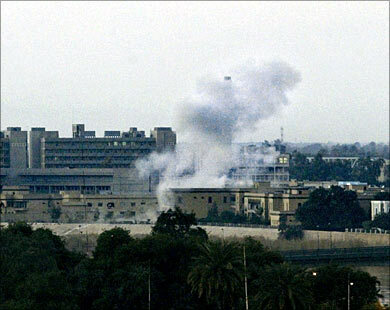 of a Baghdad building, reportedly lodging the ministry of defense. The US Marines declined to provide the cause of the (copter) crash. were hit around the country. Iraq (37) pushing the total to 1418 since the March 2003 invasion. influential members of Saddam's regime. showing its first result in a quick replacement of "war minister" Rumsfeld. 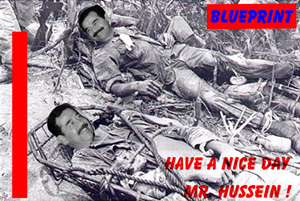 to Iraq, hoping to secure a safe transfer of power to the Iraqi administration. of some ten thousand troops as well." September 2007: Former British Chief of the General Staff, Sir Mike Jackson, attacks US over Iraq. 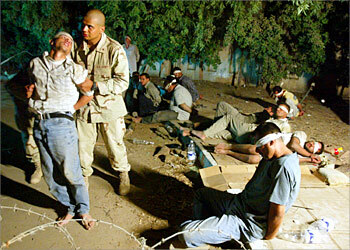 during the build-up to and the aftermath of the Iraq campaign in 2003. Have they not then journeyed in the land and seen how was the end of those before them? land, but what they earned did not avail them.